Accessibility: Over a toxic planet within the system, they are open to seebut have defenses from the network within the system for monitoring hyperspace travel and ships pratolling the system itself to defend SJO space. Description: Designed to be a massive testing and construction area. Kashyyyk provided a reasonable location to construct the shipyards. With friends she had decent relationships with, out of the way and staffed by the people who wanted the commerce building a shipyard provided. It was built using the technology developed by Sasori with a Saotome Rill Frame to provide layers and points of it with Seimei Afterglow Panels working to collect energy and give small amounts of power to use and augment the Saotome Defensive Lattice along the out Sasori Nnth hull. WIthin the interior the Sasori Agena has been used, Matsu chose the location well out fo the way of most and using weapons to set it up much like Kuat's with defenses able to defend it while ships mobile to protect it. THe concentric rings are apread around the planet and almost create the frame work of a dyson sphere allowing the Silver Jedi to maintain and work on entire fleets at a time or provide needed ships. Being connected and working with the Saotome Planetary Defense Network in the system to have monitoring and alerts. Specialty: Serving as a means to design and build Sasori's custom versions of their ships, with manufacturing lines for it mass produced versions and larger bays for cruisers and dreadnoughts to be repaired and resupplied. Market: Producing ships for Sasori's ship companies Phenex and Saotome. Maximum: Designed with anti starfighter and raiding weapons to protect it and give it minimal protection from larger ship (corvettes and above) with semi non lethal projectors for disabling attacking ships, warheads and lasers for starfighters. On the exterior they are set up spaced out and around the shipyard while the interior has a number of security systems to protect it and a keep out unauthorized personnel. External Defenses: designed for defensive measures with ion and anti fighter lasers. THe defenses are varied but lacking in turbolasers for taking on larger ships coming at it. Internal Defenses: Tied to the internal security system with modular walkways and maintenance tubes to get around for staff and droids. Biofilters for gas and poisons, scanners to activate slave circuits and guide or send out ships. Internal security is non lethal and to prevent theft or attack. Main Offices: THe brain of the shipyards, with most of the designers and droid brains that are working to oversee the shipyards. It is one of the fundamental meeting places on the shipyards for clients. Shipyards: Large drydocks and smaller sectional hangers. For manufacturing ships as needed up to some of the larger ships like the Shangri-La and Kiyomi. Or stations that can be built and deployed. 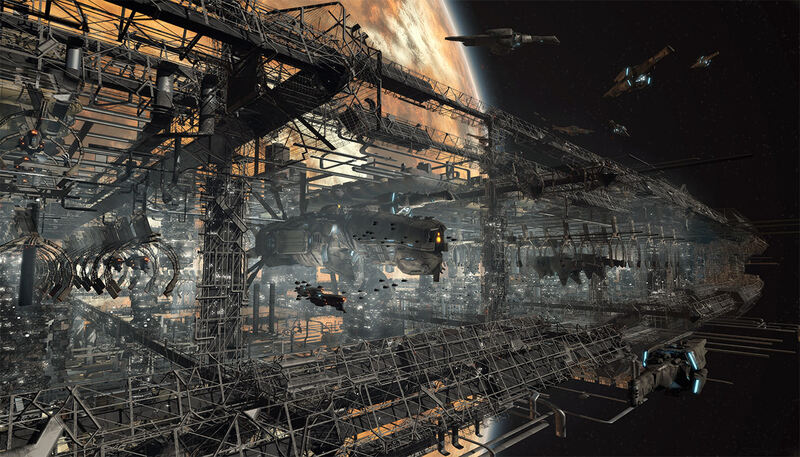 Manufacturing Lines: Built with slave circuits and droid automation to manufacture ships of the line. Residential Housing: Designed using the Living Module's created for stations and facilities. The residential housing section of the station serves to hold the staffs. Habitation Hubs: Built at the poles of the sphere itself, these are designed with the processing and mining faciltiies that use skyhooks and mining droids to scour the planet itself. Additional Links: Containing the miscellaneous links and subs for things like seats, bedding and computers. Saotome Crew Chair: Modular and comfortable seating for workers. Rack Module: For storing ships within the hangers and increasing hanger space. Following the Silver Order's relocation to Kashyyyk from Voss, Sasori dismantled its shipyards from that area and went on the move as they were now quite vulnerable to attack without the presence of the SJO. Using it more recent approach of making sure their assets and yards could be protected and semi self sustaining. THeir mining and manufacturing operations would be needed and used to keep the shipyards they had planned functioning. 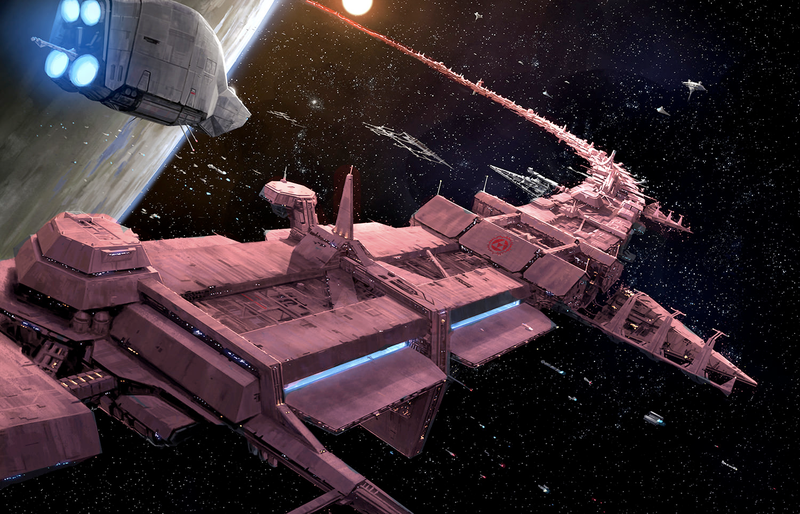 While the jedi shipwright was looking for a new location to set up its new shipyard the Silver Assembly contacted Sasori about a joint venture they had successfully brokered between the Kashyyykian and Trandoshan government, part of series massive public works project to benefit the inhabitants of the Kashhyyk system as a whole. They had already worked on several smaller projects around the galaxy to restore and build up a reputation so something larger would work. With the above support, Sasori was given permission to build an orbital ring around Kallarlarra, an uninhabited toxic world located within the inner rim of the Kashyyyk system. In exchange for allowing itself to be subject to taxation by the local governments (excluding the SJO) and providing preference to locals for employment, then the orbital ring would enjoy the full might of a dedicated naval task force for security at all times. In terms of production capabilities the shipyards are owned and operated by Sasori and its different companies for all of their uses. To build up ships that can be altered for personal use, The rings and hangers of the sphere itself are filled with quarters for crew and hangers for transporting supplies to and from the shipyards. The majority of which is automated by droid brains and computer programs. Maintaining it is a biot crew that functions to fill the optimal crew requirements to run the stations. The top and bottom sections of the sphere are large hubs for habitation (see points of interest) with skyhooks that go down to the planet itself for mining equipment and recovered supplies. Droid and biot crews that are able to handle the atmosphere and conditions while recovering materials that cn be processed and refined for use within the ship construction capabilities. Working with the governments to ensure that the shipyards were set to service and work on ships from all over. The continued work on it shipyards and her continued work with the Silver Jedi and wookiee's had the ships being brought in and mineral processing from mines across the system. Salvage from the continued attacks on the planet and system, scraps that were created from Jyoti and Gir breaking mandalorian fleets that got caught in the hyperspace security network that was around the system has only added fuel to the shipyards construction capabilities. Edited by Srina Talon, 27 October 2018 - 10:28 PM. After reviewing this submission and consideration with the rest of the Codex team I am going to have to move this to the Pre-Codex. Most of all there is an issue with the way the submission details the historical information and lore pertaining to the SJO. If you have specific questions you can PM either Allyson Locke or someone from the SJO staff team for assistance. I'd also consider streamlining the way the submission is written. Because right now it seems a bit convoluted and difficult to read. Once you have fixed up the submission you can tag either Allyson or a RPJ to bring it back out into the Codex. This submission has been moved at the request of Matsu Ike. It's now ready to review. Hello Matsu Ike! I’m glad to be reviewing your shipyard. Let’s begin! Overall, there is a lot of great information here, but there are some things that don’t quite make sense or could use a little bit of clarification for easy reading. 2.) Under Output: Can you be a little more clear about the following? I’m not sure what you mean by “lmines/mines”. “with mass-produced ships on lmines and personal yards”. 3.) Security Section: Due to the type of external weaponry listed I do believe that the security level should be “High” over “Medium”. 4.) Internal Defense Section: This area requires a fair bit of organizational overhaul. Many of the items listed here don’t really seem to be defenses at all and Molecular Furnace is listed both here and lower in the submission under Points of Interest. Please categorize these items more appropriately and describe how each of these items contributes to the defenses of the Orbital Ring. 5.) Under Points of Interest “Main Offices” – This sentence is unfinished. Can you elaborate on this? "Main Offices: THe brain of the shipyards, with most of the designers and droid brains that are working to oversee the shipyards. It is one of the fundamental..."
6.) Under Manufacturing and Supply: This section suffers some of the same troubles as the “Internal Defense Section” – Please describe how these items are integral for the Orbital Ring and consider trimming down what may not belong. An example of this would be the fact there is not only one Garment-Fabricator, but two, listed. Other items seem redundant, or, there are multiples of a machine that do the same thing simply under a different name. An example would be the “Rapid Prototyper” that is listed both in the description and then linked again below. Followed by a Synthicator and a Duplicator. 7.) The History: This section can still use some tweaking and clarification. It reads a little choppy and doesn’t always make sense. Please use your discretion to shore up your thoughts for each paragraph but I've included some examples in the spoiler below. Edited by Srina Talon, 16 October 2018 - 07:38 AM. Matsu Ike Hello! I hope you're doing well. I'm just checking in to see how things are going and on the status of the submission. sorry vacation has started so got to really work on it. I think aside from cleaning up the history everything has been altered. I'll get on that now and tomorrow. If you would like a little more breathing room I can move this back to the Pre-Codex for you while you work. But, it's up to you. Just let me know when you have a moment. Matsu Ike Hello! I hope you're doing well and thank you for updates. I went through our checklist of items to review and you definitely cleared up a lot of it but there are still a few things that need to be addressed. 1.) Under Points of Interest “Main Offices” – This sentence is still unfinished. Can you elaborate on this? I very much so thank you for reorganizing and trimming down the linked items in this submission, however, I had also asked for a description of how each of these items contributes to the defenses or benefits of the Orbital Ring. With all of the linked items in the sub, it becomes unclear how all of these things relate. It is very difficult to see and understand how they all fit in under the title of a shipyard. An example of one of these items would be: Praestigiae Ginnregin. It's listed under miscellaneous and bedding? That doesn't seem right. You can jot down the intended use of the items beside the link in a short blurb if needed but this is definitely something we need to see. With so many links (38+), many with multi-purpose effects, too much could be missed or misunderstood otherwise. Srina Talon alright edited in small details about the things. Matsu Ike I'm still going through here trying to make sure everything is kosher so I do thank you very much for your patience and effort. This was just noticed. Production states, "Starfighters, Passenger ships, Star Cruisers" but in this section, it also adds in stations? Can that either be clarified or removed if it wasn't intended? These are getting better and better everytime we look them over but some areas still need a little more attention. The "External Defenses" section on links looks pretty straight-forward. Most of them are either easily identifiable weapons or shields. The only thing I question is the note beside it. It states, "The defenses aren't massive but giving the barest protection to the station with shielding". That's a little misleading/confusing because the defenses listed for the shipyard really aren't bare. It's pretty well defended with a nice arsenal. The links under "Manufacturing and Supply" also look all right. "Internal Defenses" are explained much better with the snippet you added in. "Additional Links" seem mostly fine, but, I'm still concerned about the placement and function of the Praestigiae Ginnregin. I understand that you're using it as a reactor for this shipyard, but, I was looking for more information as to how it benefits the orbital ring. It looks like it can be used to increase the power output to either Engines [Speed], Armaments, or Defenses. Within the text portion of the sub it does note that this can be used to impact the weapons output and the shields overall strength. With that in mind, it seems that it should really be listed under External Defenses. It's not perfect, but, it doesn't belong with the bedding. If the above is also true I believe that I was mistaken and that the Security level might need to raised higher. The "Security" section also still states that it has "minimal" defenses. Again, these do not appear to be minimal but I think it's a piece of text from before the edits began. Please let me know your thoughts or when any further adjustments have been made. Thank you very much! Edited by Srina Talon, 24 October 2018 - 06:00 PM. edited an changed the rating and some wording. I meant minimally as anti fighter lasers no matter how much power you give them won't scratch most ships capable of holding a starfighter. corvette and above generally. So yes there are a lot of lasers and anti fighter weapons but if capitol ships and their escorts come it isn't going to be very effective. Still pointed out to me that the warhead launchers would give plenty so hopefuly very high rating is good. Thank you! The only thing I noticed was that from the template "Very High" actually isn't an option. So I believe the next step up from "High" would be "Maximum". That does seem to fall in line with the weaponry/defenses listed. I can't really see how a shipyard, aside from turbolasers, could have better defenses/armaments than what is listed above. Security is pretty tight on this baby. Matsu Ike I'm not sure what the special snowflake rating hahaha - But thank you, dear heart. That's all I need at the moment so let me pass it up. Jyoti Nooran Pending Secondary Approval - Sorry, not sure if you saw this. Thank you! ur a snowflake! Matsu Ike but good work and thanks for working with us Approved.